Port Louis is the capital and largest city on Mauritius. It is located in the northwest of the country and has about 170,000 inhabitants. It is the main port of Mauritius and functions as the administrative, cultural and economic heart of the country. Also, for travellers, it is a very attractive city with many historical and colonial buildings in good shape. La Citadelle fortification is another highlight and the city has an attractive background of mountains and the deep blue sea. Tourism is a major source of income and the Caudan Waterfront has a lot to offer. 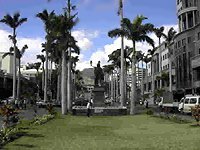 There are very good hotels, bars and restaurants and Port Louis is a good place to base yourself while exploring the beaches and nearby countryside. Aapravasi Ghat, ex-Coolie ghat - a World Heritage Site. It was the landing point for the indentured labourers, mainly from India, in the 19th century, following the abolition of slavery in 1834. Its symbolical significance has been highlighted in the aesthetics of coolitude, devised by poet and semiologist Khal Torabully. Corner House - A fabulous stationery shop, selling all kinds of wonderful pens, pencils and books. Excellent service and great range of goods. Has the most eccentric shopkeeper. Worth visiting just to see him. China Town where you will find Chinese shops and restaurants. You may also find some Chinese pharmacies. The Stamp Museum, Mauritius Natural History Museum and the Blue Penny Museum. The Mauritius blue penny and penny orange from 1847 are among the rarest stamps in the world, and you can view them here along with a plethora of other rare cultural and historical artifacts from the island. Champs de Mars horse racing track. Free access. To get a nice view on the races, climb to the Citadelle on the neighbouring hill. Port Louis market known as Bazaar Port Louis where you find local products, cheap clothing and spices from Mauritius. Travellers' Lane, in Jardin des Compagnies, with travellers' texts ranging from Marco Polo, Duarte Barbosa to Ahmad bin Majid, as devised by poet and semiologist Khal Torabully, a travel writer born in Port-Louis and Al Idrissi's planisphere. Fire Walking - This Tamil ceremony takes place between December and February. After ten days of purification, meditation and praying, penitents go to the temple where they walk slowly across a pit of burning coal - said to represent the outstretched sari of Draupadee - before dipping their feet in milk to cool down. Holi - This is an important time for joy and sharing in the Indian calendar. During this frenzied but always good-natured event, men, women and children throw coloured water and powder on each other while wishing one another good fortune. Id-El- Fitr - Signalling the end of Ramadan - the fasting period for people of Muslim faith - Id-El-Fitr sees participants exchanging gifts, giving alms to the poor, and visiting their families and friends to wish them good fortune for the months ahead. Thaipoosum Cavadee - Celebrated in honour of God Muruga, the son of Lord Shiva, Thaipoosum Cavadee is not only the most important festival in the Tamil calendar, but also the most spectacular. After ten days of fasting and prayers in January/February, devotees embark on a pilgrimage to local Kovils (Tamil temples). Throughout the procession, these devotees carry ‘cavadees’: carved, wooden structures decorated with leaves, flowers, fruits and photographs of saints, each designed to honour Lord Muruga. The celebration has gained notoriety in recent years because many of the devotees pierce certain parts of their anatomy with fine needles, including their cheeks, backs and chests. Chinese Spring Festival - Chinese New Year Day is celebrated each year on a different date because of variations between the lunar and solar calendars. According to Chinese custom, no scissors or knives can be used on the day of the festival. Red - a traditional symbol of happiness - is the dominant colour, and food is offered to attendees to ensure abundance during the year. A wax cake is, for example, customarily shared between relatives and friends. Firecrackers are set off to drive away evil spirits, but the ‘pièce de résistance’ is the famous Dragon Feast - performed a few days into the New Year - when Chinese dancers and musicians take to the roads and perform the traditional Lion dances. Maha Shivratree - In this festival, thousands of pilgrims, all dressed in white, walk long distances and converge on the sacred lake of Grand Bassin, carrying the ‘Kanwar’ - wooden arches covered with flowers and small mirrors. Maha Shivratree is celebrated in honour of Lord Shiva. Hindu devotees fetch holy water from the lake and ceremonies take place over three to four days. The whole scene is reminiscent of the great rituals that take place on the banks of the Holy Ganges in India. 12th of March, National Day - Independence Day is celebrated with great national pride all the way across Mauritius. Ougadi - This festival celebrates the New Year of the Telegu - an Indian ethnic group - and is characterised by the preparation of elaborate family meals, cultural shows and the distribution of prayers, cakes and sweets between relatives and friends. Ganesh Chaturthi - Celebrated by Hindus on of the fourth day of the lunar month in August/September, this festival commemorates the birth of the Hindu God Ganesh. Small replicas of the God, with its elephant head, are taken to the beaches or to riverbanks so they can be immersed before sunset. Père Laval pilgrimage - Every 9th of September, Mauritians of all faiths walk or drive to Sainte-Croix near Port Louis to visit the tomb of the Blessed Jacques Désiré Laval - the ‘Apostle of the Black People’. The celebration around Père Laval, who is believed to have healing powers, reminds us of the fervour of the Lourdes pilgrimage in France. Interestingly, Father Laval was the first person beatified in the pontificate of Pope John Paul II. Divali - Celebrated in October/November, Divali marks the victory of Rama over Ravana: of light (truth) over darkness (ignorance). It also commemorates Krishna’s destruction of the demon Narakasuram. During this festival, small clay lamps are lined up on walls and balconies and in yards. They are lit at sunset and their golden beams - believed to guide the Goddess of wealth and good fortune into the lantern owner’s house - can be seen everywhere across the island. Port Louis has a tropical oceanic climate with moderately high temperatures and humidity throughout the year. Temperatures average between 25 °C and 30 °C during the day, warmest being November to April, coolest between June and September. Nights are around 22 °C in summer, 18 °C in winter months. Rain occurs in all months but the wettest period is from December to April. During these months tropical cyclones occasionally strike or pass near enough to give very heavy rainfall and violent damaging winds. Sir Seewoosagur Ramgoolam International Airport (MRU) is 50 kilometres from Port Louis and is the hub for the national carrier Air Mauritius. International destinations with Air Mauritius include Antananarivo, Bangalore, Cape Town, Chennai, Delhi, Durban, Frankfurt, Geneva, Hong Kong, Johannesburg, Kuala Lumpur, London, Melbourne, Milan, Mumbai, Munich, Nairobi, Paris, Perth, Reunion, Singapore and Sydney. Several other airlines fly to a few of these cities as well, like Air France, Air Madagascar, British Airways, Meridiana, Emirates, Condor and South African Airways. Additional destinations are Rome, Lyon, Nantes, Nantes, Mahé (Seychelles), Dubai and Zürich. China Town where you will find Chinese shops and restaurants. Yuzu (Labourdonnais Hotel), Caudan Waterfront, ☎ +230 202 4000. Asian. Phoenix Pale Ale locally called spider beer. Hotel Le Champ de Mars, 22 Frère Felix De Valois St., ☎ +230 212 7373. Le Saint Georges Hotel, En face de l'ambassade française, 19 St Georges St., ☎ +230 211 2581. An internet connection can be hard to come by on Mauritius, although there are one or two small internet cafe's in Port Louis. Most hotels do have connections though. Mauritius' international country code is 230. Mauritius Post offers services, which are fairly reliable but not overly fast. For parcels, contact companies like DHL, UPS or FedEx. We have a comprehensive list of accommodation in Port Louis searchable right here on Travellerspoint. You can use our map to quickly compare budget, mid-range or top of the range accommodation in Port Louis and areas nearby. This is version 21. Last edited at 10:22 on Sep 28, 18 by Utrecht. 9 articles link to this page.